Rajasthan Royals had won the toss in their match against Mumbai Indians and chose to bowl first. Jos Butler was named Man of the Match. 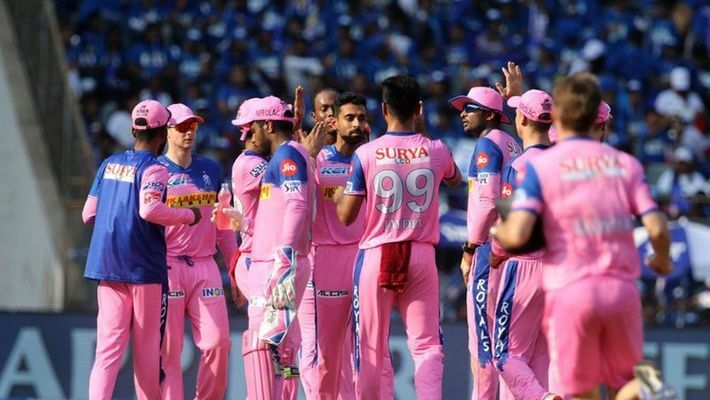 Rajasthan Royals won the battle of nerves to win their second encounter of the 12th edition of the Indian Premier League (IPL) against Mumbai Indians at the Wankhede Stadium in Mumbai on Saturday. However, Rajasthan had lost their way midway through the chase, losing four wickets in quick succession, and sending their hopes of winning the match into disarray. Rahul Chahar removed Jos Buttler in the 14th over of the innings, and that kept the hosts alive. Rajasthan Royals skipper Ajinkya Rahane had asked the opposition to have a bat. However, as the innings progressed for Mumbai Indians, it seemed that Rahane had made a wrong call as Rohit Sharma and Quinton de Kock put on 96 runs together. Once the former departed, de Kock cut loose and hammered the Royals bowlers all around the ground. He went on to score 81 off 52 deliveries. His innings was laced with six boundaries and four mighty sixes. In response, Buttler started off his innings in exactly the same manner, giving his side a perfect start. Buttler and Rahane went on to register a 60-run partnership which eventually helped the side keep up with the required rate in a stiff chase. In the penultimate over of the Rajasthan innings, Bumrah had sent Steve Smith back to the pavilion and would have got another one had he had the support of the wicket-keeper. Bumrah produced an edge off Shreyas Gopal's bat on the last ball of the 19th over, but Kishan couldn't hold on to the catch despite diving to his right. To make matter's worse, the batsmen took a single, putting Gopal back on strike for the last over. Gopal then took a double on the first ball of the 20th over, which was followed by a delightful boundary to end the chase in an emphatic manner. Things could have been different if Kishan had taken that catch. Kalaburagi election: All is not well between Mallikarjun Kharge, Naganagouda?